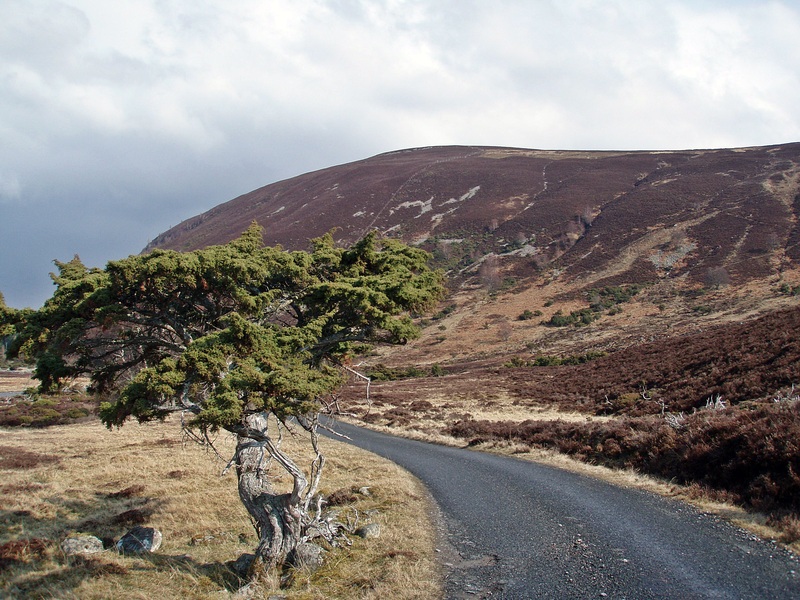 After spending the winter months with short local walks and trips on my new mountain bike, mainly around Loch Ness and the lower Monadhliaths, I was keen to get out and do some “proper” walks, besides it was time again to get fit for the TGO Challenge. 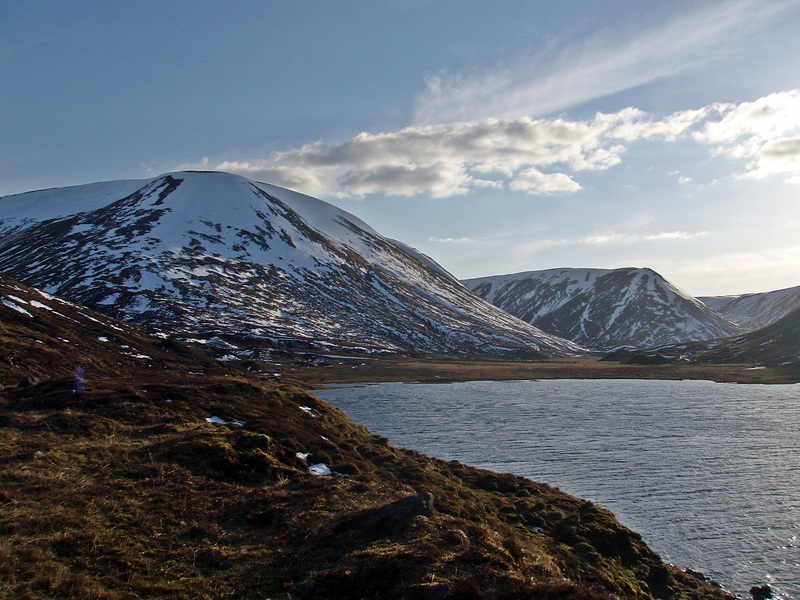 At first I had planned this route as a mountain bike trip, but I wasn’t sure about the section along Loch an Dùin (which seemed to be very narrow in places), and if I’d be able to complete this route in one day. In the end I decided to walk it in two days, and I’m glad I did! 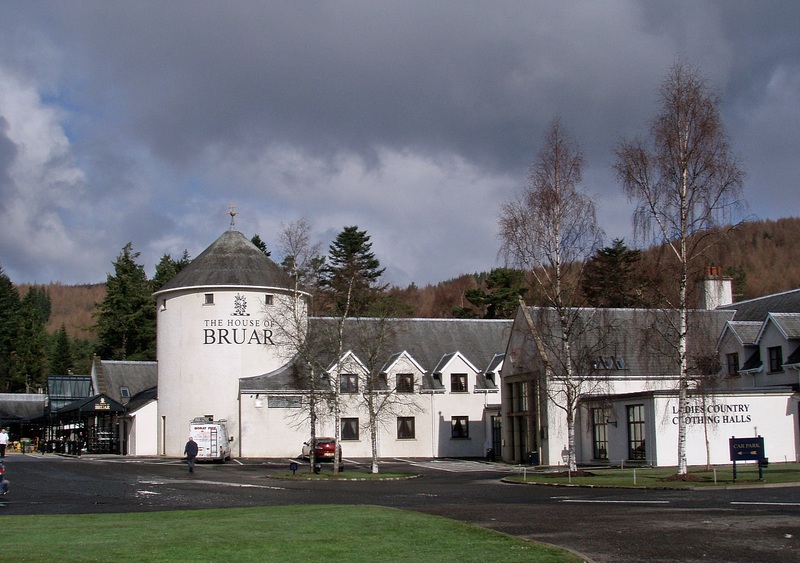 I drove down to Kingussie and left my car in the long stay car park, then caught the Citylink bus to Edinburgh and was dropped off at The House of Bruar at 10:00. 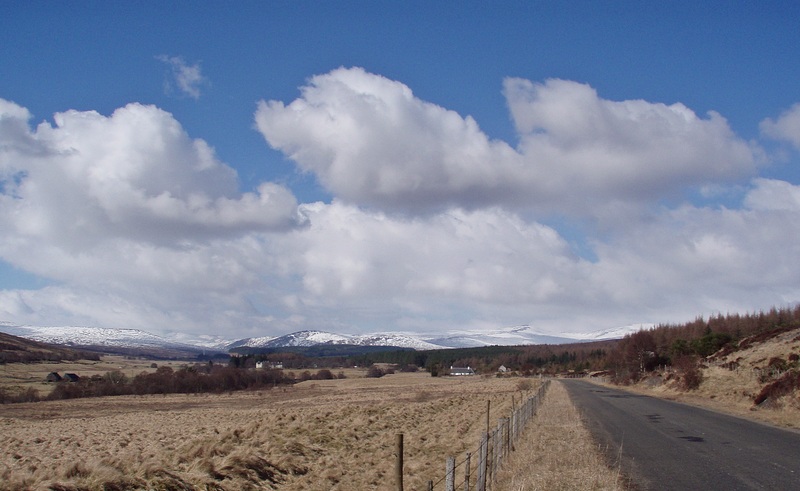 I started walking W along the B847 which is part of the National Cycle Route 7 from Inverness to Glasgow. 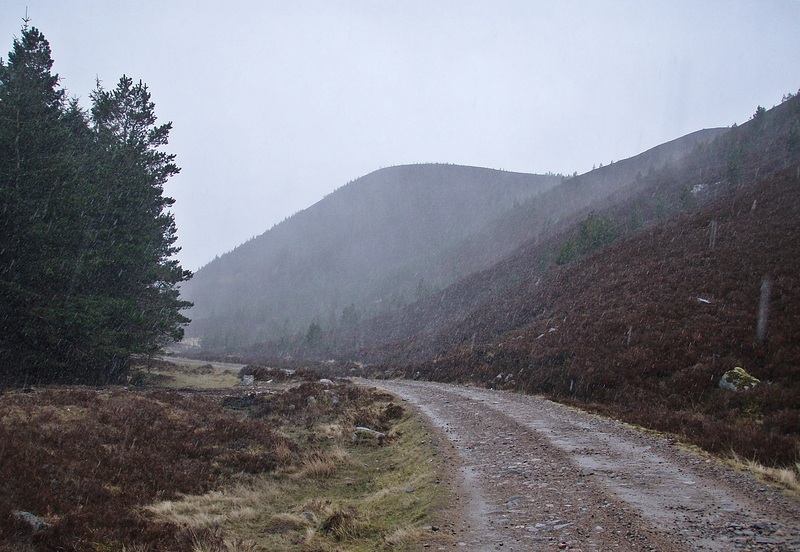 After Calvine, the route follows a quiet single track road running parallel to the A9. I had not been looking forward to this section, expecting a lot of traffic noise from the busy A9, but it wasn’t that bad because of the trees between the two roads. It was surprisingly scenic and pleasant to walk! 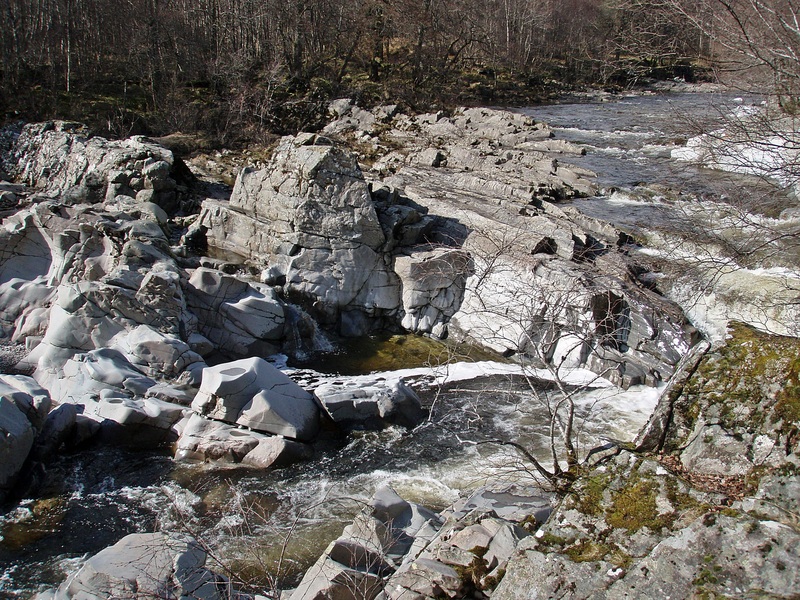 Eroded rocks in the River Garry. 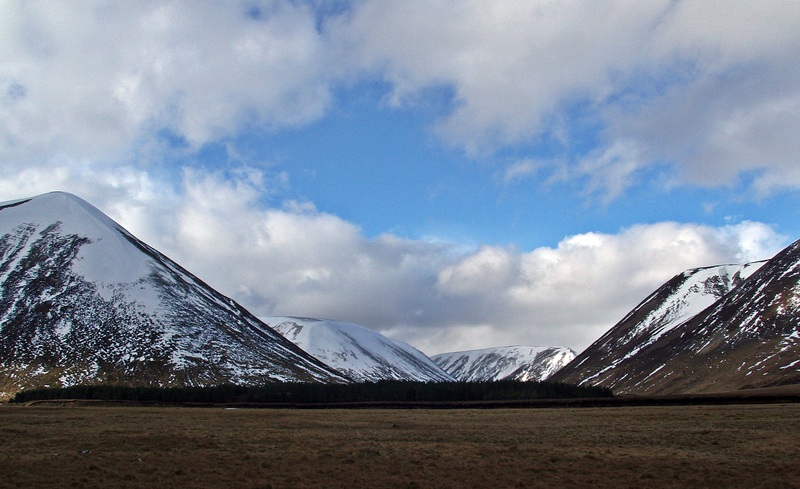 Glen Garry, with the Drumochter Munros in the distance. 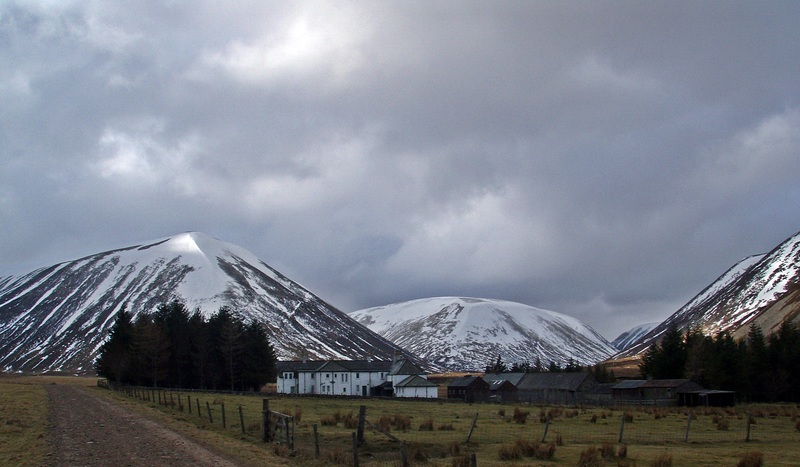 At Dalnacardoch Lodge I crossed both sections of the A9 and entered Dalnacardoch Wood on a forest track. 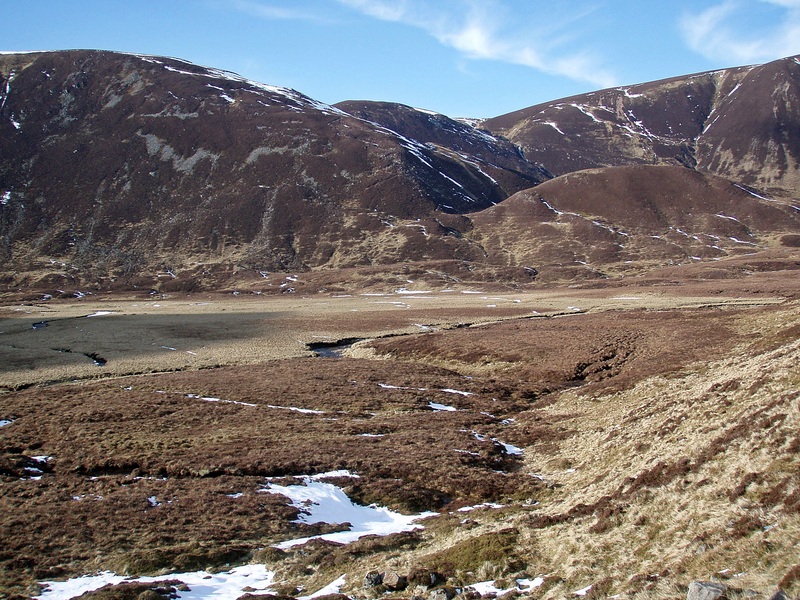 After the forest, a Land Rover track leads along the Edendon Water to Loch an Dùin. 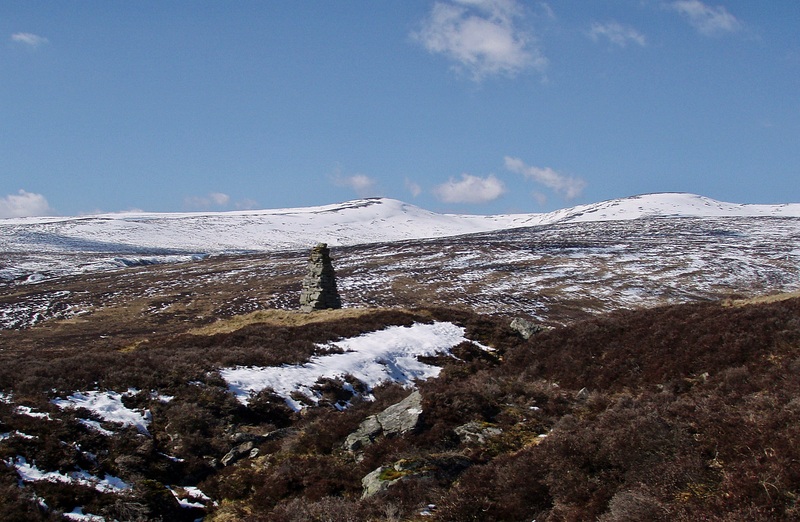 Cairn near Creag nan Sionnach. I stopped for a short break at the ruined building at Badnambiast and had a look inside. 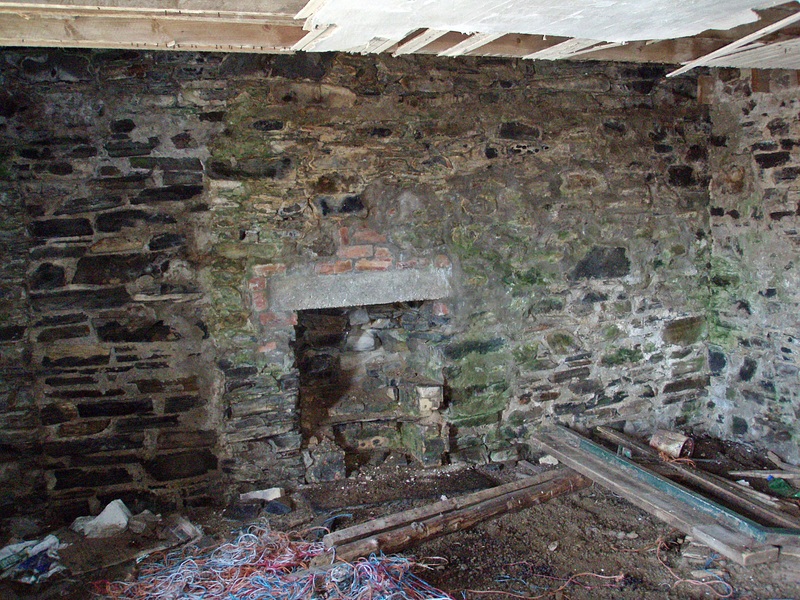 Inside the ruined house at Badnambiast. Bridge across the Edendon Water. I really enjoyed the walk along the river, it was sunny and warm and the scenery became better all the time. 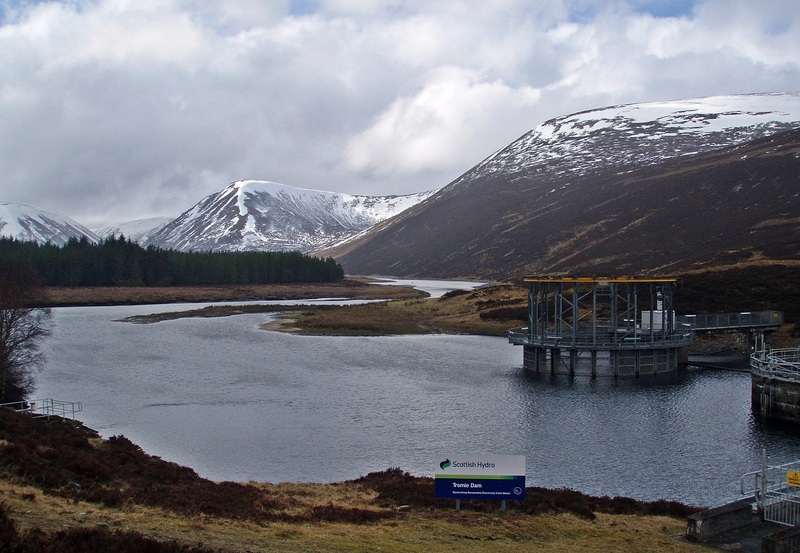 The Edendon Water with the Gaick Corbetts An Dùn and A’ Chaoirnich. At Sronphadruig Lodge I chatted to a Corbett bagger who had just climbed A’ Chaoirnich wearing wellies (!) 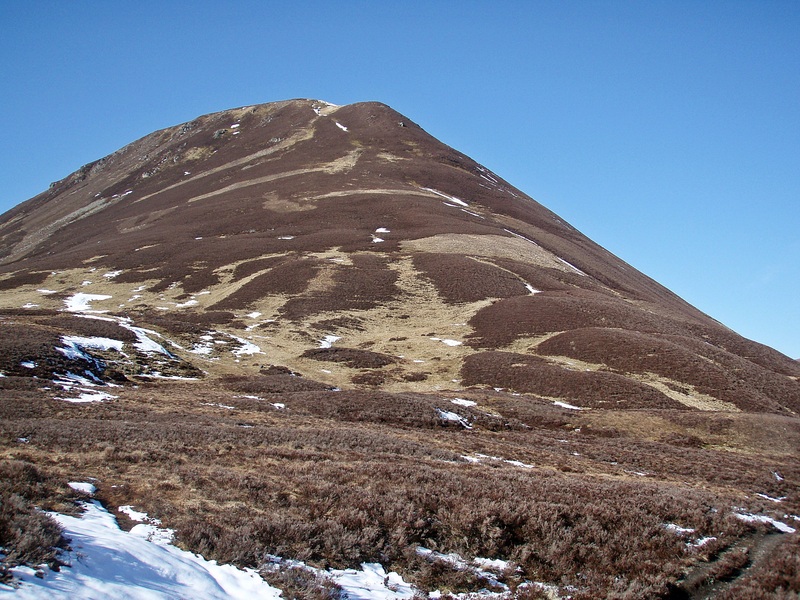 and was waiting for his friends who had gone up An Dùn as well, they had all cycled in from Dalnacardoch. 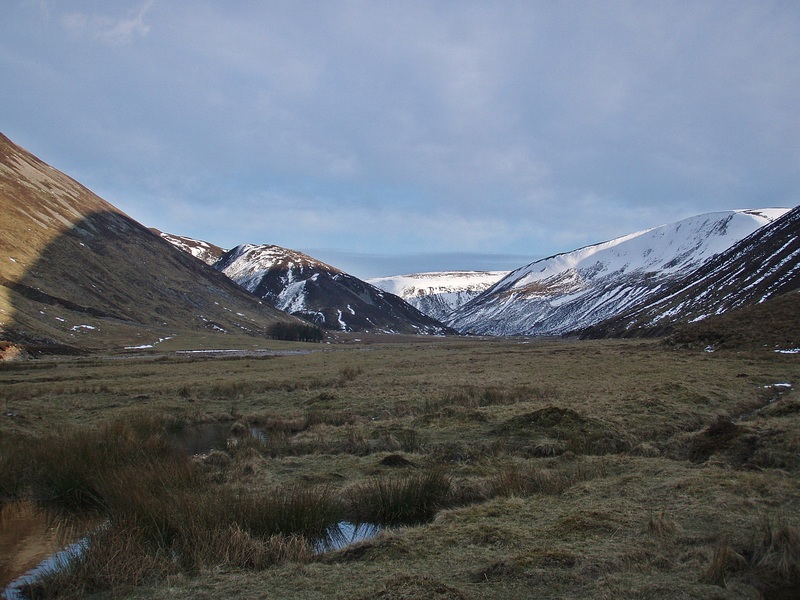 I continued past the Lodge and stayed on the E bank of the river, trying to locate the path along Loch an Dùin. So far the route would have been perfect for cycling, but at this point I was glad I hadn’t brought my bike. The ground is very boggy and I would have had to carry the bike most of the way. Looking back along the Edendon Water. I suppose this track along the loch is perfectly ok for anyone who is used to riding a mountain bike, but I’m still practising and I would have been struggling even with pushing the bike along… it is quite narrow after all! 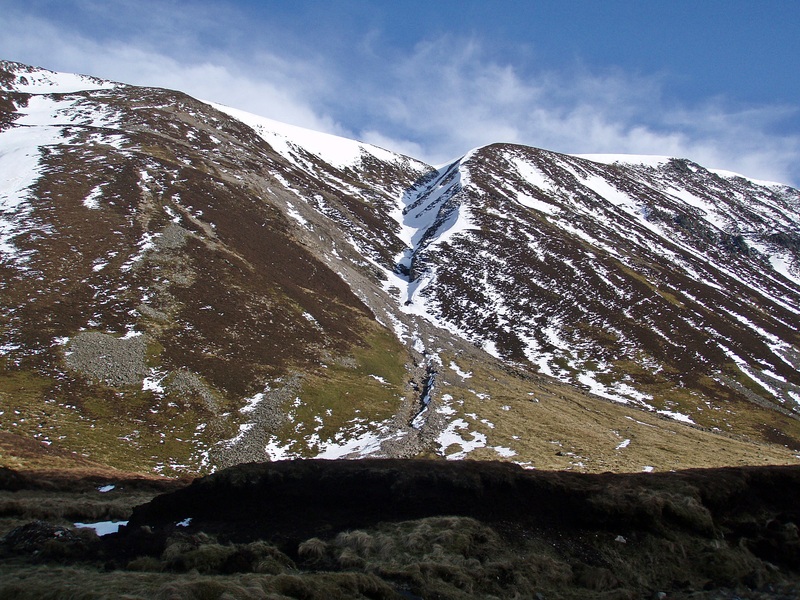 Steep gully of the Allt Creag on the W flank of A’ Chaoirnich. 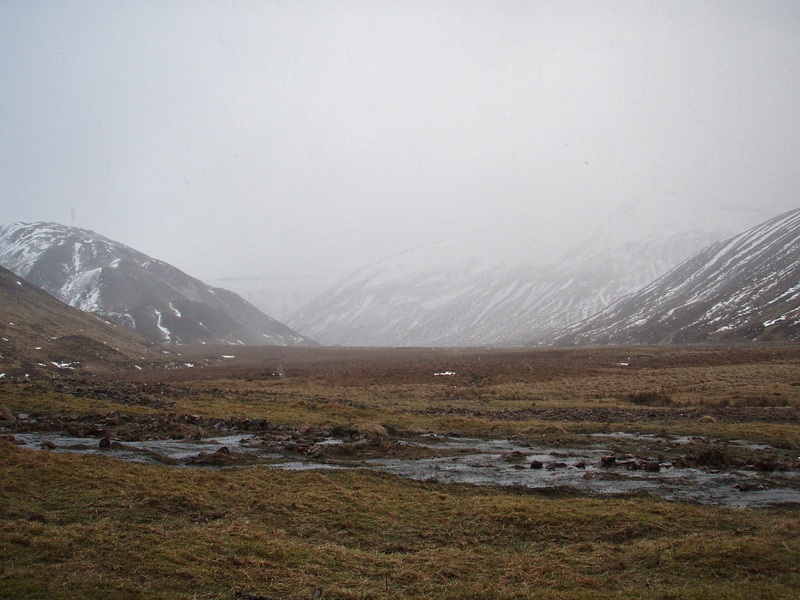 After fording the Allt Loch an Dùin at the N end of the loch, I had reached the area where I had planned to camp. 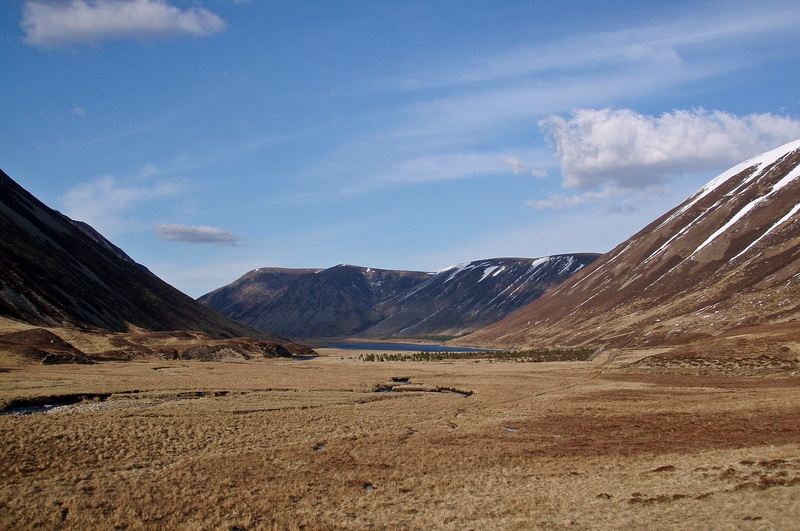 But it was only 16:00 and too early to stop, besides the wind had picked up in the meantime and the wide glen seemed to exposed for putting up a tent. 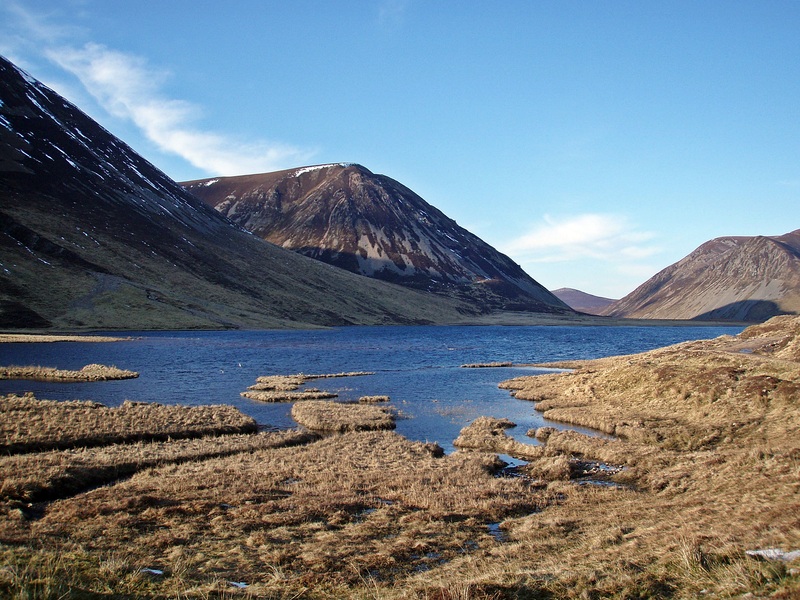 So I continued walking towards Loch Bhrodainn. 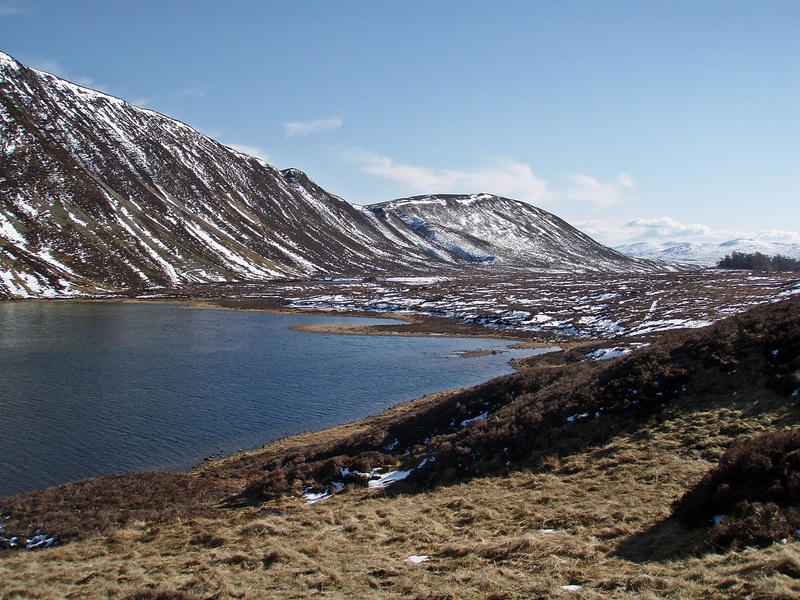 Loch Bhrodainn with Sgòr Dearg in the centre. 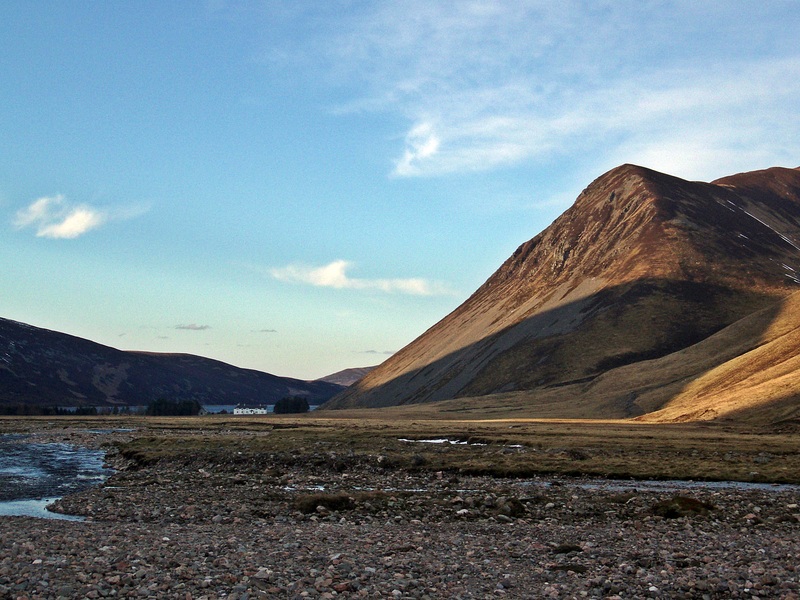 View back along Loch Bhrodainn. 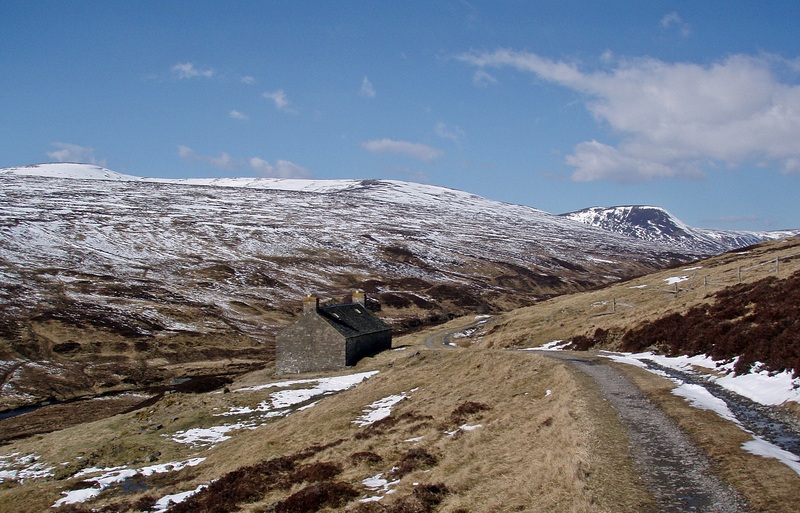 Gaick Lodge in the distance. 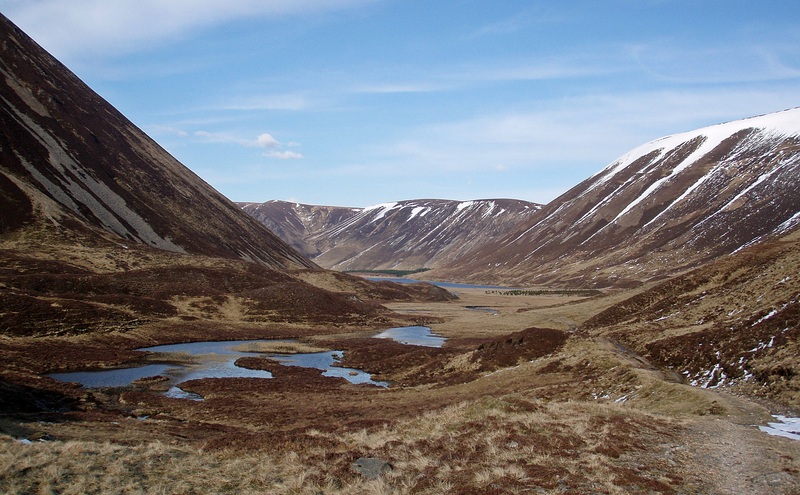 I didn’t want to camp too close to Gaick Lodge, so I turned right into the glen of the Allt Gharbh Ghaig, hoping to find a sheltered place for the night. 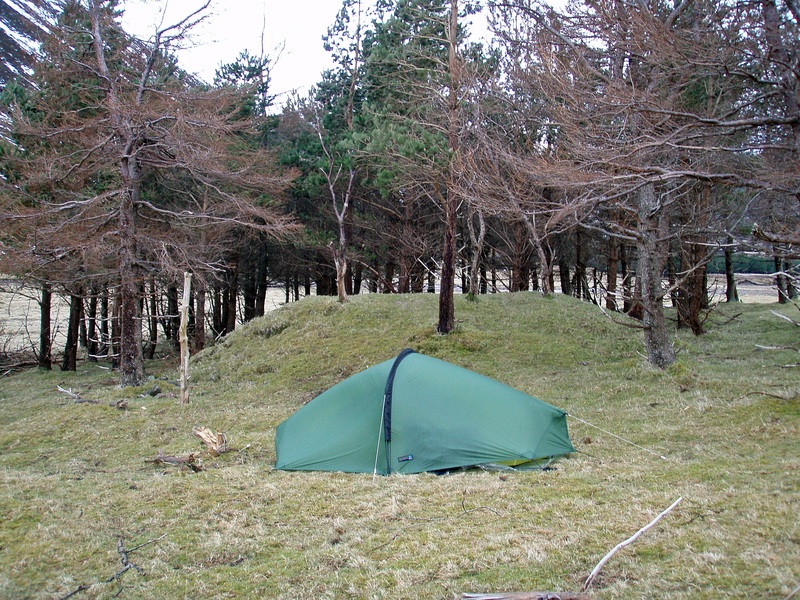 With the wind coming from NW, I pitched my tent behind the wooded area, but the trees were so far apart that the wind was still shaking my tent during the night. 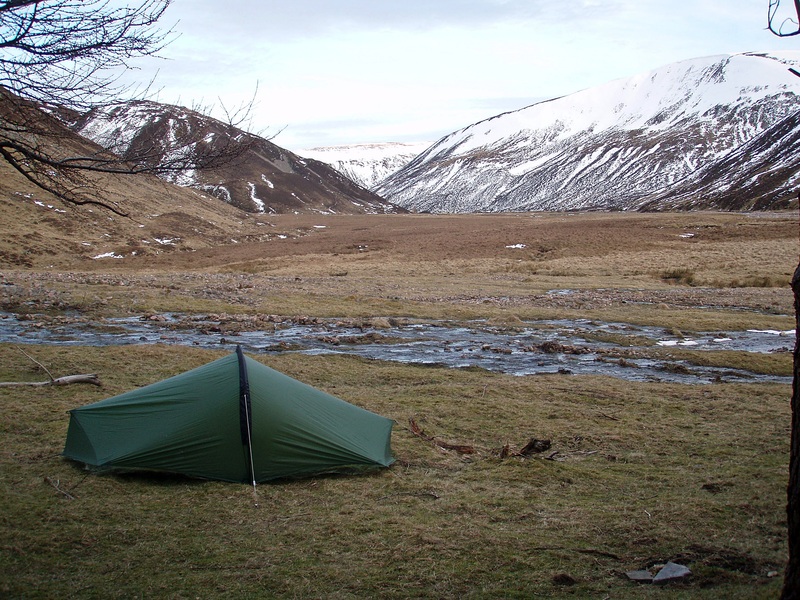 When I looked out of my tent shortly before 07:00, it was very cold and there were even snow showers in the glen. An hour later, it was dry but the wind was still buffeting my tent. It felt much colder than yesterday, and after packing up the tent, washing my hands in the ice-cold stream and filling my water bottle, my hands were numb with cold for a while. A short time later it looked as if the weather might clear and it could become another nice day. 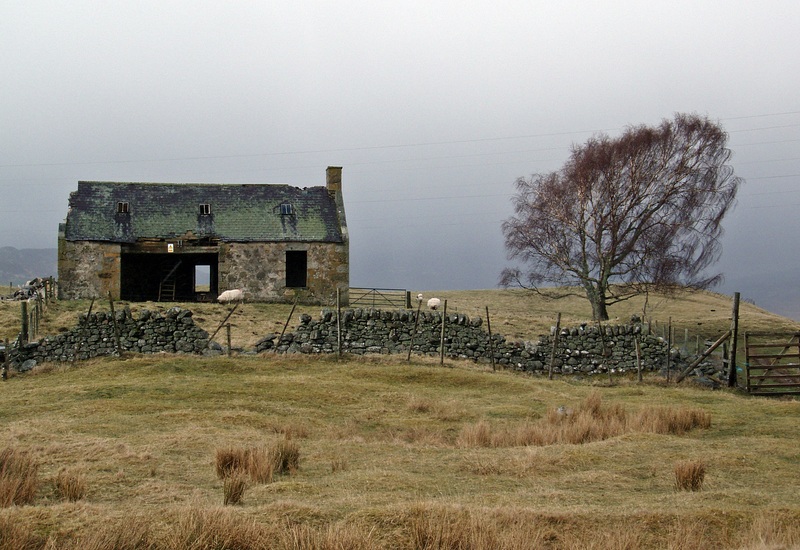 But very soon the sky above Gaick Lodge turned grey again. Snow showers in the distance. 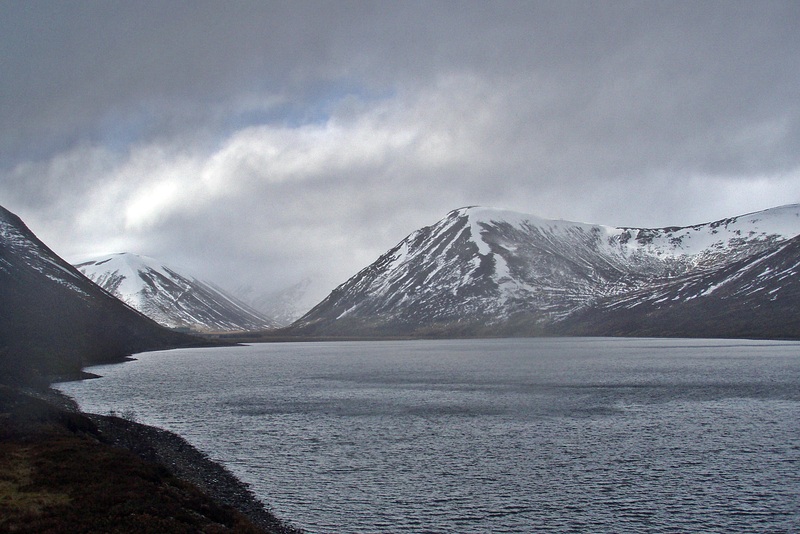 Just when I reached the wooded area past Loch an t-Seilich, the snow and hail showers caught up with me. A Land Rover approached from the other direction and the driver stopped for a chat. 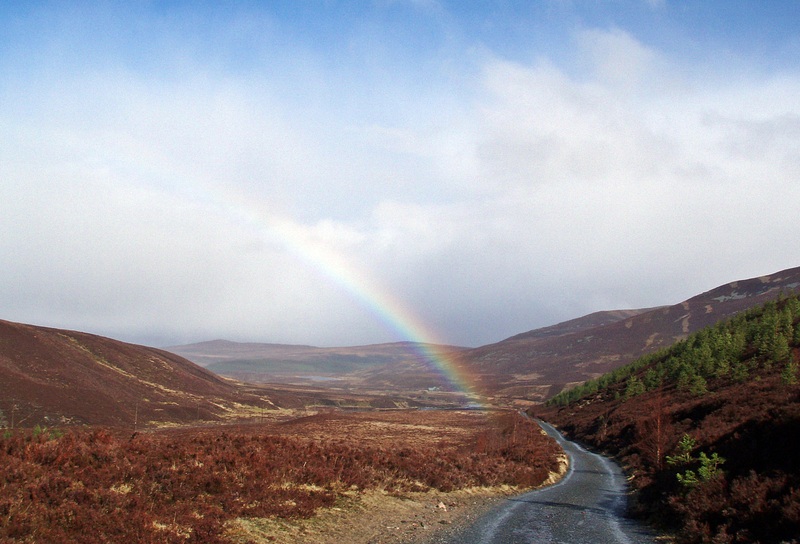 Further down Glen Tromie, the sun came out again. 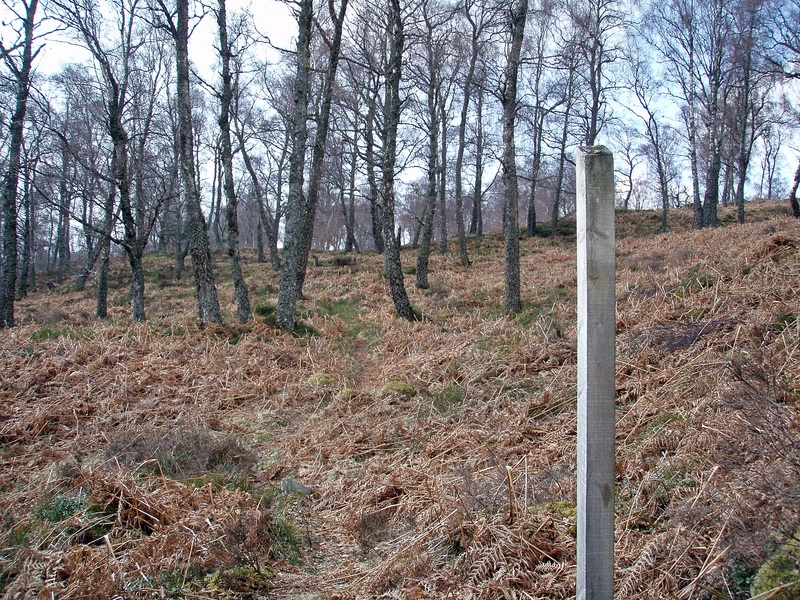 At Glentromie Lodge I left the road and followed the signposted path through the forest and over the hill to Kingussie. 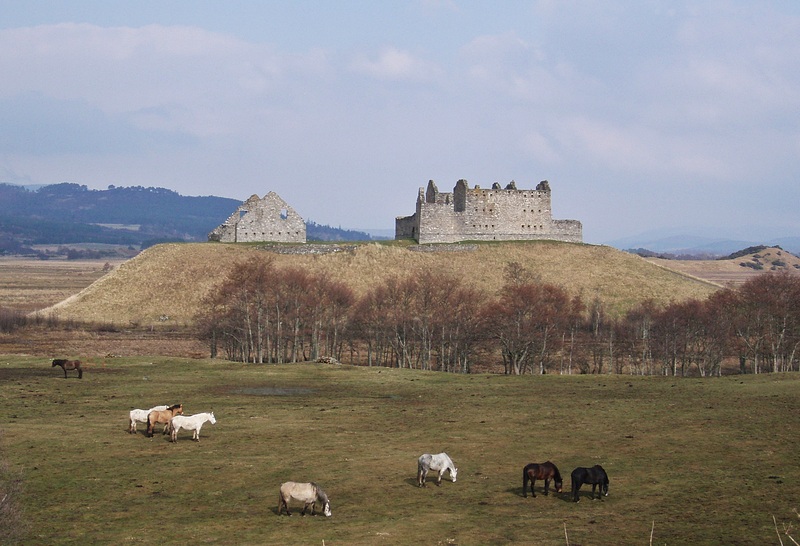 Ruin at Braes o’ Ruthven. This was an easy walk, completely on tracks, paths and roads without any ascent to speak of, but it was perfect as a “leg stretcher” and I enjoyed being out again. It would have been nice if the second day had been as sunny and warm as the first, but the weather could have been a lot worse! 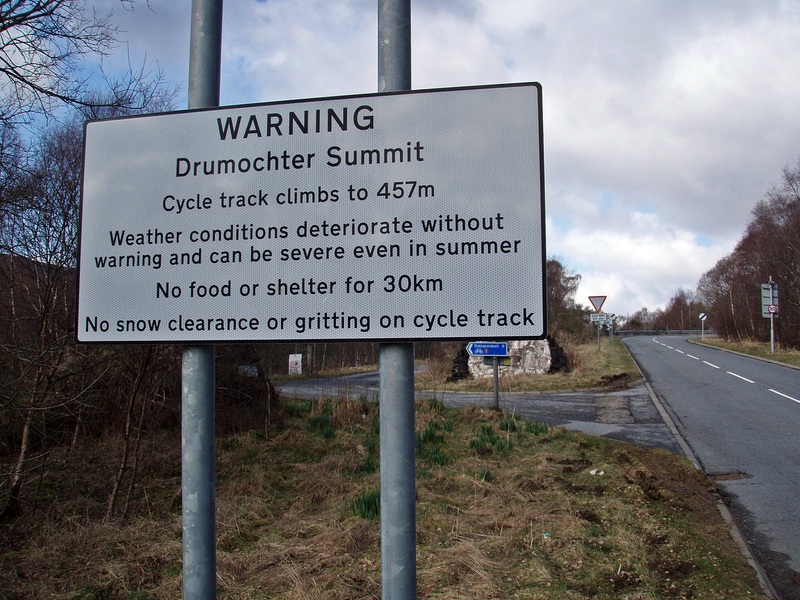 I’m planning on cycling the Gaick Pass sometime but on my little fold-up. 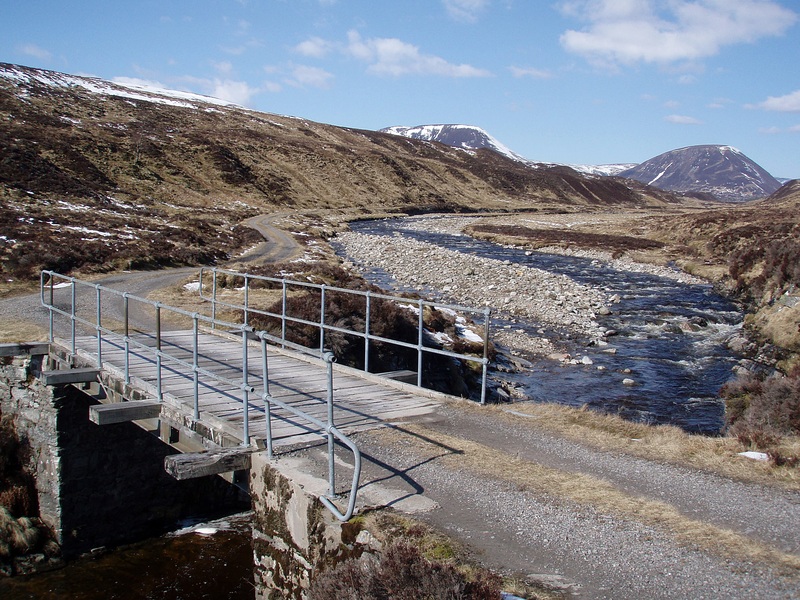 How long is the not-very-cyclable section past Loch an Duin would you say? Is that the only difficult section for a bike? I’m not sure what kind of tyres your bike has got, but in general I would say a mountainbike would be more suitable. Even on some of the better sections the track is quite rough with lots of potholes. 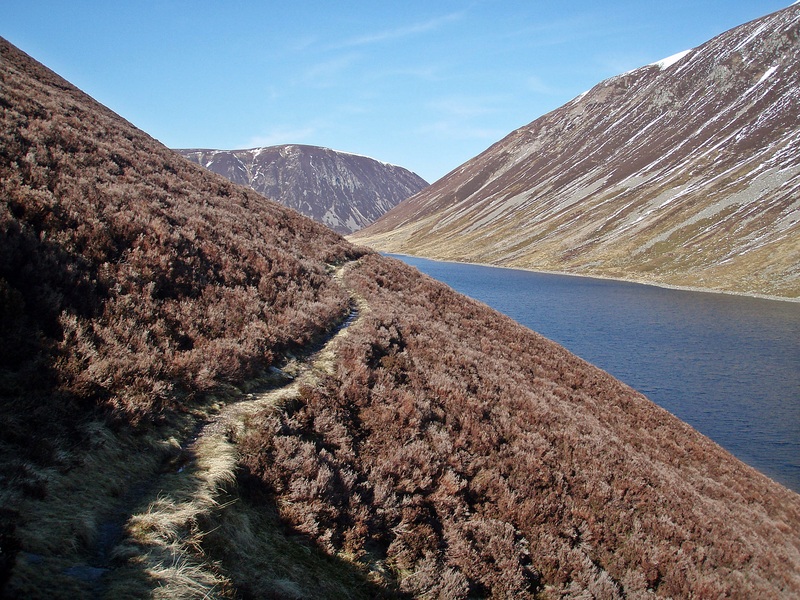 The single track section stretches along the whole length of Loch an Duin, that’s about two kilometres, and there is not really enough space to walk beside a bike (at least I don’t think I could). 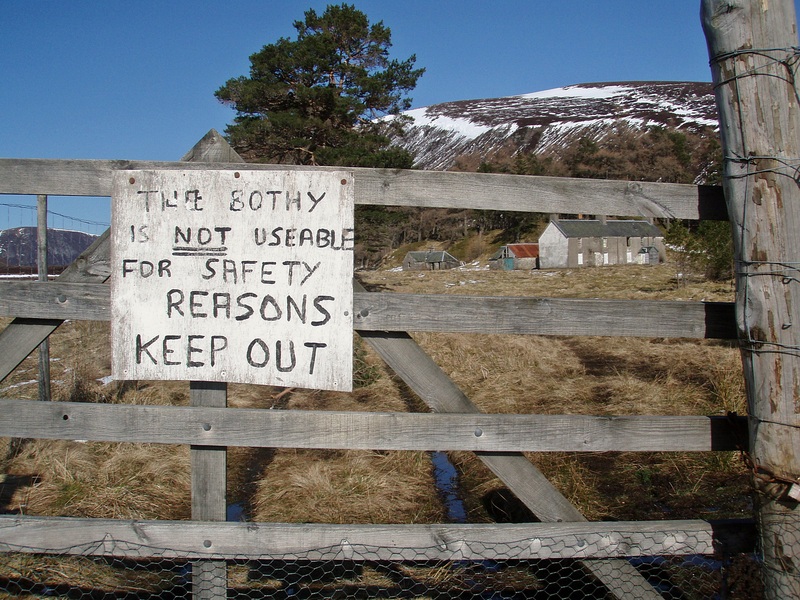 Another awkward part is the boggy area before Loch an Duin where you would have to carry the bike. 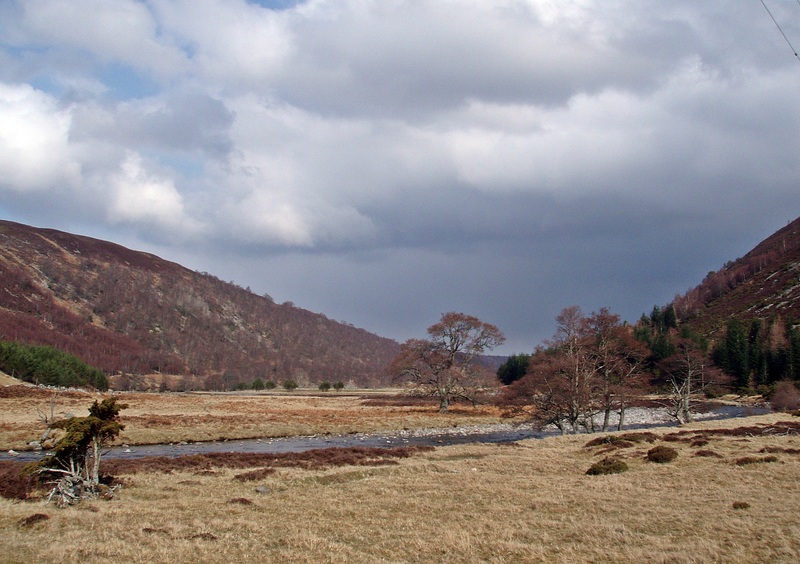 I stayed on the east bank of the Edendon Water to avoid the two river crossings, but with a bike it might be easier to keep to the track, ford the river twice and pick up the narrow path along the loch immediately after the second crossing. 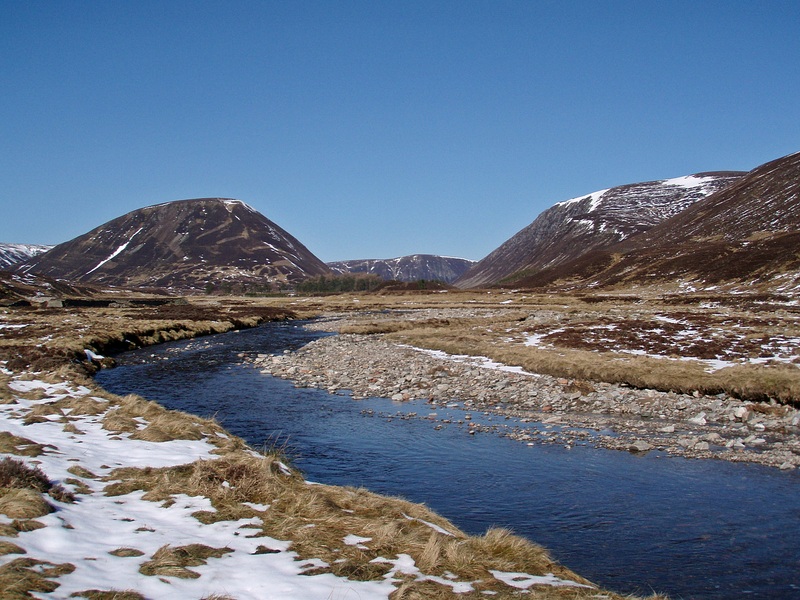 The ford at the outflow of the loch was straightforward and I got across with dry feet, but the one at the Allt Gharbh Ghaig was more challenging. 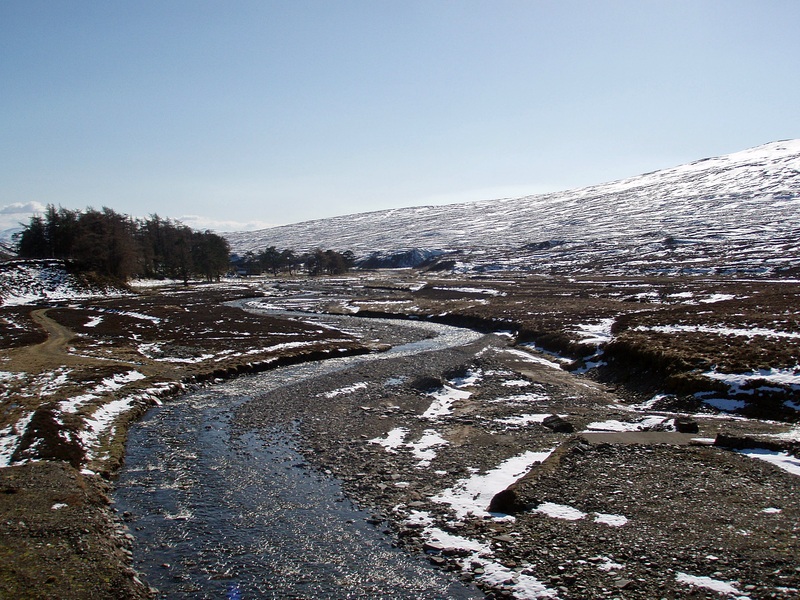 It was a fast-flowing river and even further upstream it was still shin-deep, but that might have been because of the snow-melt at the time and maybe it’s not always that bad?